Intel has started to release officially the graphic chipset drivers for Windows 7. Here is the link for Windows 7 RC1 82945G Express Chipset, one of the most used in UMPC and Tablet PCs (Used in the Fujitsu P1610). 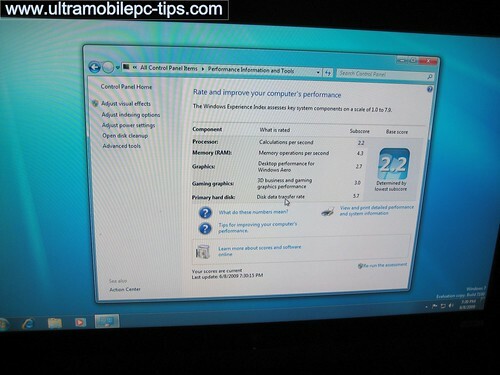 The coming soon N510 Netbook from Samsung will use a Nvidia chip. What's the gain? 1080p support is not enough? "The Netbook term was created by Intel to define a segment offering a limited experience, but with Ion you don't have those same limitations," Nvidia's Haas said. "These systems can handle mainstream gaming, HD video, and new GPU-powered applications. You might as well call them notebooks, because that's what they are." HTC Sense is a visual fantasy with an added little bit of better functionality. There are rumors that it will be released for current G1. To me, the Fujitsu ST6012 is one of the best looking slate tablet pc released in the last few years. From the point of view of Hardware is not bad either. The only point I don't like is the price. Come on! Is this an Apple?! $2000!? $2579!? have they heard about the reception?! 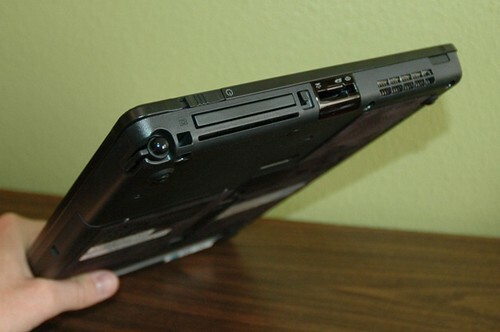 Any way, GotBeMobile has posted some really good pictures of this Tablet PC. Except for still feeling a little sluggish, I have not lacked for anything. From an integrated SD card slot to PC card slot to a 1280 x 800 screen, I have not experienced any compromises in going slate mode with the ST6012. 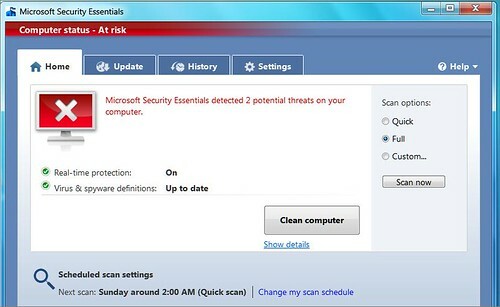 Yes, I installed Microsoft Security Essentials Beta. It's too early for an educated opinion. Testing an AV is not easy unless you have a private Zoo full of Virus and Spyware. Still, I scanned my PC and it found two issues. One of them is a version of VNC that I use to remotely assist some clients. So even when there is some risk I would call this a false alarm in my particular case. The other one was a legit one. Here are some screen shots of the program in full action. 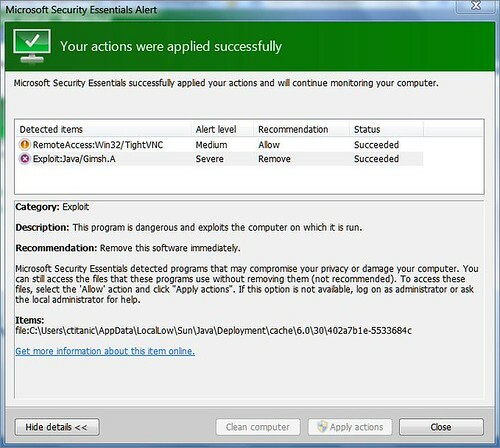 Microsoft will make available a Beta of it's new Antivirus software next week. A beta of MSE will be available in English and Brazilian Portuguese for public download on June 23, 2009 for the first 75,000 users. This is a target number, but Microsoft is willing to increase it if necessary. Blogging has became a way of life for many and when this happens you have to become creative and like in any other job arm yourself with a set of tools that will allow you to be the best. Because that’s what is it about. People pay you for blogging because you are the best or at least one of the best. My fellow blogger Steve from UMPCPortal has posted a very good article about his experiences streaming live video for his blog. It’s really interesting to see how he has managed to create a fully portable/mobile solution using an UMPC. 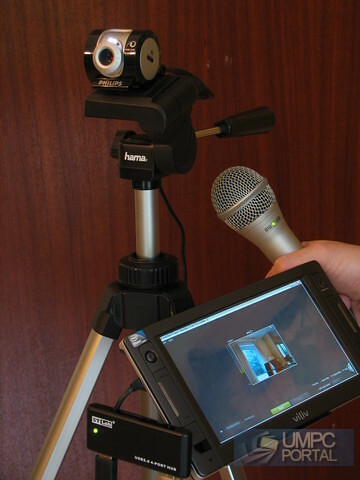 I spent some time testing different webcams, microphones and configurations and have come up with a 2KG setup that will allow you to do live, mobile broadcasting over Ustream with reasonable quality. The total cost of the solution is under $1000 and the setup can not only be used for live streaming but can be used as a complete Ultra Mobile live blogging solution. Julie at Gadgeteer has spent a week using the Palm Pre and with that experience has prepared the most complete review I have read lately about this device. My Palm Pre is going back to Sprint. Probably tomorrow. I like it, but I just don’t love it. I had high hopes for it that haven’t quite been met and the carrier coverage in my area doesn’t really make me want to switch away from AT&T right now. As far as the actual device is concerned, I guess I have my standards set too high. Like new gadgeteer contributor Bryan Sherman and I talked about the other day, I need to quit wishing for some new end all be all device to come on the market because it’s probably never going to happen and I’m likely never going to be satisfied. What would make me satisfied with the Pre? A metal body, better slider mechanism, MicroSD card slot, better macro mode for pix, video recording capability, GSM version and physical buttons on the front that allow you to answer / end a call. Julie ends her article saying “Don’t Give Up, Palm” and that’s the feeling that I share. Palm came from being the best PDA maker to be less than nothing in this industry. Now I personally see the Palm Pre as a comeback. And I really hope this time the company actually find a way to fight against the iPhone, the Android and… why not, Windows Mobile. 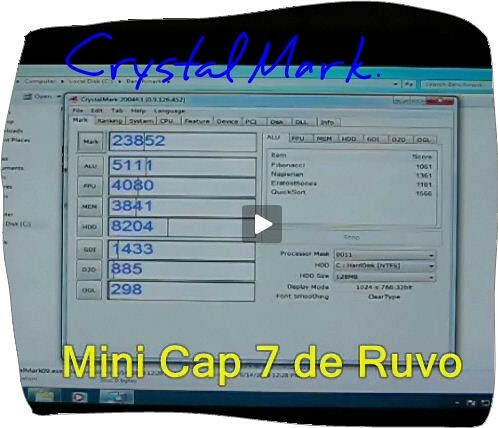 Here is a short video where you can see the Mini Cap 7 using Windows 7. I have been running some performance tests in the Ruvo Mini Cap 7. The machine out performs many of the Netbooks and UMPC currently in the market, I would say easily. I prepared a video for todoumpc.com (Sorry guys, it's in Spanish), where I played DVD, 720p and 1080p videos and in my opinion the machine handles the DVD and the HD 720p videos really well. The HD 1080p skips frames but I think that that with some tuning, selecting a good player, good codecs and a good video format, probably it can handle too this HD format. I also installed Ubuntu but still too early to share my impressions about this experience. The only thing that I can say is that it runs out of the box without me having to change or install anything. So far The Archos 9 is the first UMPC announced with W7. A complete different picture than when Vista was about to be released. It's like OEMs are being very cautious this time. Unlike its predecessors, which are basic touchscreen internet media tablets, the Archos9 is a touch tablet that can run a full computer OS. It also features a built-in webcam, 120GB of memory, full touch support, an external mic, streo speakers, and a toggled-on optical trackpad and an on-screen keyboard, and will be available in Europe this October—around the same time as Windows 7’s release—for €450 ($635). Yes, VisionObjects has developed what I believe is the first handwriting recognition software for Android: MyScript. Yes, it’s a phone and it’s a MID using an Intel Atom processor. Since Microsoft pushed the UMPC concept into the market we keep seeing new devices some really smaller some not but one thing is for sure, the market exist and it’s healthy. I installed today W7 in this device from Ruvo. I suspect that this demo unit has a SSD because W7 installation went super fast, less than 20 minutes. All drivers were working right after the installation, the only one with some issues was the Sound one, but after installing the provided driver for Vista everything was working fine. I going to start running some tests later but here is the first one for those that have been asking. W7 Performance score. Here is the same screen taken from my Fujitsu P1610 that can be used as reference. Without any doubt, the Mini Cap 7 performs a little bit better than the P1610. The Mini Cap 7 can be ordered at todoumpc. Just like the uber-hot Viliv S5 , this Viliv X70 is beautifully-manufactured, features a great battery life, and has plenty of power to deliver a full, no-compromise, rich internet experience. And that's just the start of its capabilities. Kinpo is working on a 7" Android tablet that will be powered by a Freescale processor, where it offers a decent 800 x 600 resolution on its 7" touchscreen display. But, that’s not as important as the OS that will be used in this tablet… Android! I don’t know why but it seems to me that in 5 years we all are going to see Android as an alternative selecting what OS we are going to be installing in our PCs. One thing is undeniable, the Original Origamis have left a mark in the design of all SFPC (Small Factor PCs) that came after them. And that’s the case with the HTC Shift design, I have seen at least two UMPC in videos coming from Computex of future devices using the same technology used in the Shift. One of the cases is the Compal KAX15 UMPC. One the most interesting news I have seen coming from Computex is one reported by JKK about Pixel Qi Screen, a new kind of screen using a technology that is a mix between LCD and e-Ink. According to Microsoft the term netbook is not good. Guggenheimer pointed out on June 2 in Taipei during Computex 2009 that since some of the mini-notebooks already feature capabilities more than just purely Internet browsing – which is the main purpose of the netbook – therefore the term netbook should be abandoned. And I’m fully agree with that, even the term MID which was stamped by Intel initially for devices purely designed just for Internet now is being used to call what was before called UMPC. That’s completely crazy. Why to name them by one of it’s functions when these devices can do more than that? How I would call them? Ultra Small PCs (USPC) perhaps? Small Factor PCs (SFPC)? or just keep calling them UMPC? Probably the best thing to do is to keep using the old term UMPC instead of creating a new one and as result more confusion. According to news at The Wall Street Journal we will have in our PCs the retail version of W7 this October. Microsoft Corp. (MSFT) on Tuesday announced the date the latest version of the Windows operating system, Windows 7, will be in general commercial availability: Oct. 22. What can I say. I have been using in my main PC W7 since the first beta was released. Why? Because since I used it for the first time I don't want to go back to XP and a lot less to Vista. Acer has confirmed, according to news published at Android Community, that they will be releasing a Netbook using Android in Q3 of this year. According to Acer’s global president for IT products, Jim Wong, “today’s netbooks are not close to perfection at all” and that “if we do not continue to change our mobile internet devices, consumers may not choose them any more.” However there’s still work to be done fettling Android in its netbook guise: “we’ll still have to see what kind of applications the Android software can run on and how stable it will be” commented Vincent Chen, an analyst at Yuanta Securities. Here is a video of the HTC Hero ROM using a new version of Android. This OS is getting better by day and that together with news about some netbooks being shown in Computex using Android is leading me to think that Android could become a really big headache for Microsoft really soon.